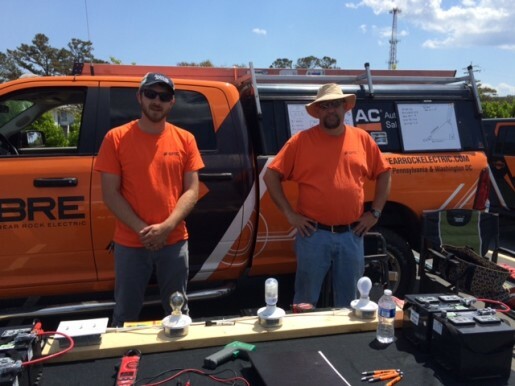 The North Carolina Science Festival at the College of the Albemarle – Roanoke Island Campus in Manteo, North Carolina featured exciting demonstrations from Bear Rock Electric, Inc. (BRE) electricians, Chris Albrecht and Eric Albrecht, as part of the festival’s “Create your Future with STEM (Science, Technology, Education and Math) Day on April 22, 2015. 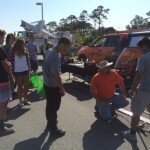 Programmed by Dare County Schools, the Manteo festivities were part of a month-long, state-wide series of events created to expose high school students to a wide range of STEM careers and opportunities. 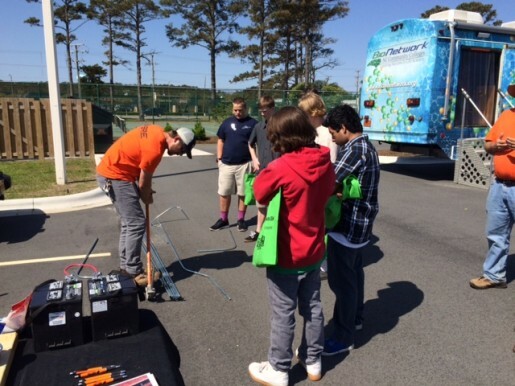 Along with classroom presentations and tours, students had a chance to meet-and-greet STEM professionals, try out new technologies, visit the NC STEM Bus and participate in an engineering design challenge. The festival had over 300 students this year. 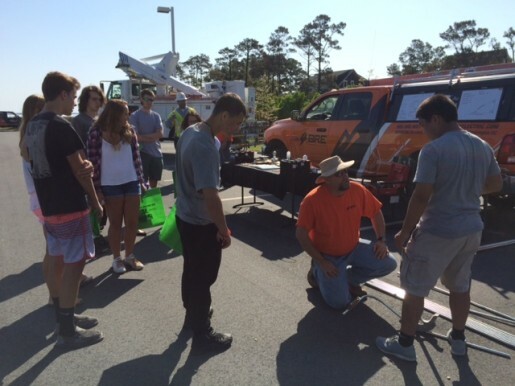 BRE master electrician Chris Albrecht and electrician Eric Albrecht presented three different hands on activities. The first set of demonstrations focused on a set of batteries, parallel circuit vs. series circuit. An inverter was used to convert 120 volts to power three light bulbs: incandescent, compact fluorescent (CFL), and light-emitting diode (LED). Chris then provided the students with an amp meter so they could see the difference in the amount of energy used by all three light bulb types. Then, the students were handed an infrared thermometer so they could determine for themselves how much heat is put off by each bulb. The objective of the lesson is for them to conclude that LED light bulbs require the least amount of energy input and heat output, while the incandescent bulbs soak up the most energy and put off the most heat. As a test of strength (and math), the students were given an opportunity to bend a half-inch EMT (electrical magnetic tubing) pipe. They learned how to calculate, using calculus and algebra, the shrinkage and method for 90° and 30° bends. The focus of this year’s sessions and keynote is to encourage students to “dream big, but not just dream…make things happen, think outside the box, study hard, don’t be afraid of math and science! 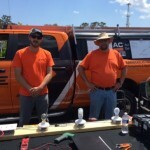 Find your passion.” Chris, Eric, and all of Bear Rock Electric are proud to join in this exciting endeavor. 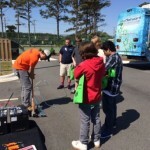 For more information on this and all the exciting Science Festival events happening throughout North Carolina, please visit ncsciencefestival.org.